Sometimes team sports turn out out to not be as fun or engaging as a child may need. Teens and children quitting football due to the high danger of injuries, such as concussions, is becoming more and more common . 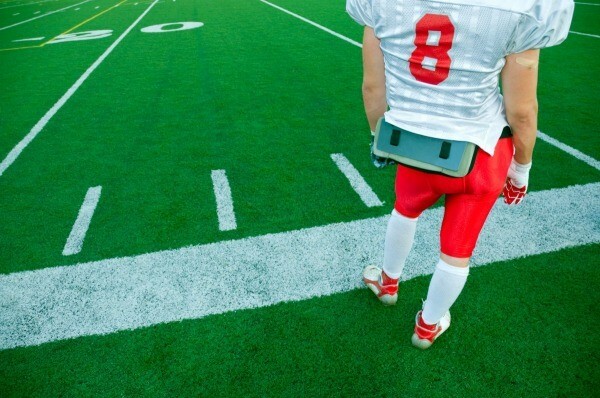 Question: Should I Let My Son Quit Football? My son signed up for Football. At first he went to all the practices and is doing great at it. Now that school has started (he stated junior high and new school) he is fighting that he does not want to go, that he is getting really bad headaches. He says it is to hard with school and Football. Do I let him quit, or make him finish the season? Any advise? Let him quit. It's his choice. Archive: Should I Let My Son Quit Football? My son signed up for football. At first he went to all the practices and was doing great at it. Now that school has started (he started junior high and new school) he is fighting that he does not want to go, that he is getting really bad headaches. He says it is too hard with school and football. Do I let him quit, or make him finish the season? Any advice? One thing I wonder, and not sure if this could be a possibility, is could there be something else going on? Like someone giving him a hard time at school? If he is having horrible headaches (you may want a doctor to check him out) it could be stress related, especially if someone is possibly bullying him. It may be worth having him checked out because of the headaches either way, he is still young and shouldn't have headaches like this and maybe the doctor can talk to him to see if there is anything else going on. Maybe let him talk to the doctor one on one. Bad headaches are a symptom. In contact sports, like football, it could mean an injury, like a concussion. It could also be stress, but all the kids have stress at this transition, so it would have to be a symptom of something more than the usual stress. Yes, let him quit! Adolescence is the process of his finding what sorts of things he is suited for, so let him sample a million things (with his taking some responsibility for costs). Football is famous for concussions that have lifelong effects including blinding, untreatable headaches, and spinal damage. I would not insist on his finishing what he started in such an optional, supposed-to-be-fun thing. If it were math or science, he would have to keep going to fulfill the requirements. But this is sports! Speaking from experience - I'd say first get the headaches checked out. Did he get hit and perhaps have a concussion no one was aware of? If he checks out fine - encourage him to play. We have 2 sons - one would not pursue h.s. sports and he was very good. I'm afraid it was friends who did not play that caused his decision. We fought and argued but gave in - he got mixed up with the wrong group and I won't get into the rest. By all means, let him quit. What if you won't let him quit and he hurts himself badly? You will never forgive yourself. That being said, we never allowed our son to quit something he wanted to start in the first place. He had to at least finish the season, year, job whatever. The headaches are another issue. They should probably be checked out no matter what, to ease your mind. He may just be using them as an excuse. Junior high is so tough for kids anyway. Be sure to let him know that you are letting him quit because of your concern for his health and that you agree with him that his schooling comes first. Lisa, this is a good question. I am a parent of a son that quit football due to an injury many years ago, also a former coach for 10 plus years and a former football player as well. First, I hope you and your son have a good relationship and you are open to talking with him about anything. I am very concerned about the headaches, are they real or imagined and have they been an ongoing health concern? Wow! I am amazed at the amount of people who say let him quit! My parents never let me join any sports, cheer-leading, or drill teams because of the expense. I grew up with low self esteem and I think a lot of that could have been boosted by being in something...sports or otherwise. On the other hand, I have a friend who allows her child to sign up for baseball, soccer, etc. and then quit when something does not go his way. He's only nine and he does have a pattern developing that can only steer him towards being a quitter. I read about half the responses and quit. I had had enough. Isn't it possible that this child has 'had enough' of the pressure? Whoever encouraged him to play is part of the problem: he doesn't want to disappoint anyone. Then there's the real issue of school work. Isn't an education the reason he is in school? Sure, some kids get athletic scholarships, but it appears he would never be a candidate anyway. He doesn't need to be treated as if he has done a 'bad' thing. In fact, he should be commended for having the wisdom and courage to recognize that he cannot give his best to either activity and the courage to admit it. Thank you for all the posts. The football playing was his idea. His father is into toy trains and I have never seen a football game. His problem is he does not like going to practice, he just likes playing in the games. It is a fight every night to get him to go, but then he gets mad when they don't play him in the games because he was not at practice. "Why give it up just because you don't like to practice?" Because when you don't go to practice, you're letting your whole team down and frankly you're probably not that good of a player if you don't practice. He just doesn't like practice. That explains everything right there. He wants the glory and the credit, but he doesn't want to put forth the effort. The question isn't whether or not to let him quit, the question is whether or not to use this teachable moment to help him learn responsibility.